Nitrite spikes can strike right after you have treated your aquarium for an Ammonia Spike. This happens because your aquarium has more nitrite than your biological filtration bacteria can handle. Why Does The Water Always Test So High For Nitrite? Your water should always test for zero nitrite once your aquarium has been cycled and established. 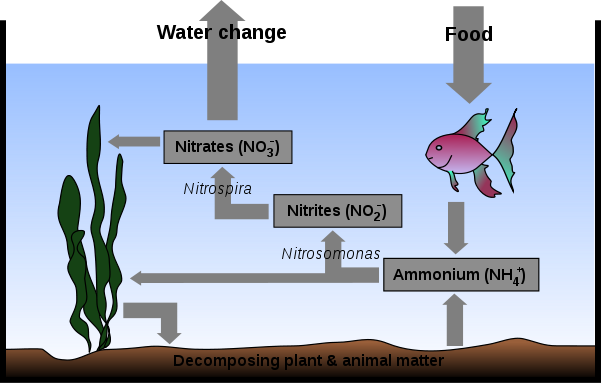 This second deadly chemical in the Nitrogen Cycle can indicate several problems in your aquarium that you must do something about quickly. Catching serious aquarium problems in the Nitrite Spike stage can reduce the chance of having further problems later on. If your tank sustains a spike in nitrite soon after you have filled it, then you may still be in the cycle process. But, if you have an established aquarium, this spike can be caused by a biological filtration bacteria die off, an excess bio-load of fish, an abundance of living or dead algae, to much time between maintenance and water changes, over feeding, or a recent Ammonia Spike. Reduce the amount of algae in your aquarium. Reduce the amount of food that you feed your fish by 1/3 to 1/2. Remove dead plants and leaves from your aquarium. Remove some fish from the aquarium to lessen the bio-load. Do a 50% water change and thoroughly vacuum the gravel. Add Bio-Stars or Bio-Balls to your filter system. Nitrite levels should be returned to zero when your aquarium is healthy again. At 1 ppm (part per million) nitrite begins to be deadly to fish and can lead to bacterial and fungal infections. It may take several days to sort this issue out and don't be surprised if it is quickly followed by a Nitrate Spike. For more information on Nitrite Spikes, go to Wikipedia's Nitrite page.